Being a mother has been one of the greatest achievements of my life. Each of my kids is an achievement, and they are also big achievers themselves. Some say that it is a cycle. We, as parents, make our kids successful, loving achievers and in return they make us successful, loving achievers. One of the best descriptions of my feeling towards them is pride. They do amazing things and I am enormously proud of them. I have come up with a theory that I like to call “Pride Therapy”. Every time one of my kids has an achievement, by proxy, I have also achieved something. In my coaching and presentations, I sometimes ask people to describe their feelings as animals. I find it makes it easier to express these feeling. It does not have to be an animal that represents all your feelings all the time. Each feeling is a different animal. For example, you might be a panther in the office, and a sloth on a relaxed Sunday. To help people understand the idea, I share my feelings/animals as an example. I came up with the peacock as a symbol of pride. Motherhood is like being a peacock: you show off your feathers in pride, where every beautiful feather is the reward for your good parenting ability. 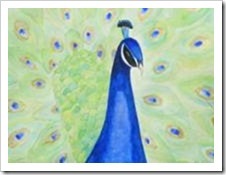 I often use the phrase “proud as a peacock” to express my feelings and happiness. Last year, I started going to art classes to develop my creative ability (and to force myself to get out of the house rather than work all the time. This was a great opportunity for me to express my feelings of pride. My first attempt was a water color piece which you can see above. The second attempt was an acrylic piece on canvas. I called it “Mom”. Every string of hair represents an achievement for my child and every feather represents the pride that I feel. I hope this will inspire you to find your feelings about parenting. Think of the animal which best describes your feeling and try to present it in any way you like.